The bodice is made of black heavyweight twill and is fully lined and boned at the lacings. It laces up through professional-strength grommets with an orange and black organza ribbon. The peasant shirt is made of black cotton and has elastic in the sleeves and neckline (gothic sleeves do not have sleeve elastic). The shirt length is approximately 32” or hip-length. You can choose short sleeves (default), long sleeves or gothic sleeves. The underskirt is made of black cotton and has an elastic waist. The skirt will come hemmed at 28" (approximately mid-calf on someone of average height) unless a shorter length is requested. 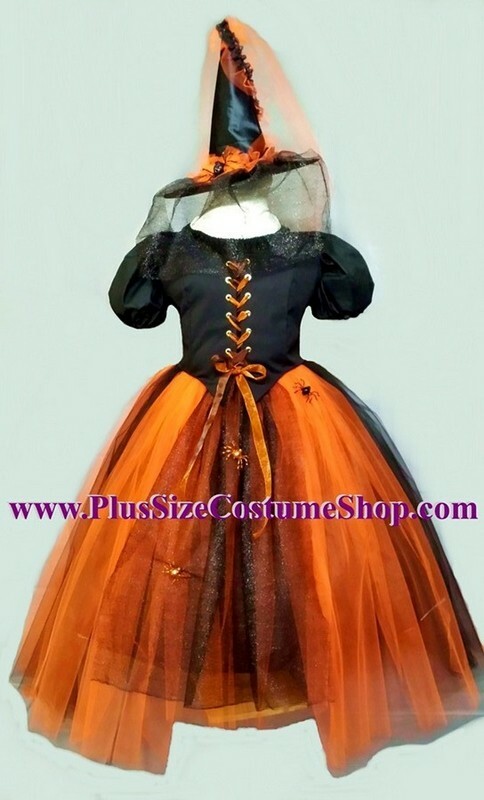 The overskirt is made of strips of orange and black tulle with a center piece of black sparkle web tulle. The overskirt has a drawstring and ties around the waist. There are three glittery spiders (attached with clips) crawling up the skirt. The overskirt will come hemmed at 40” (long - will usually work for up to 5'10" tall) unless a specific shorter length is requested. In the picture, the skirt is hemmed to 28" in the front and 40" in the back. 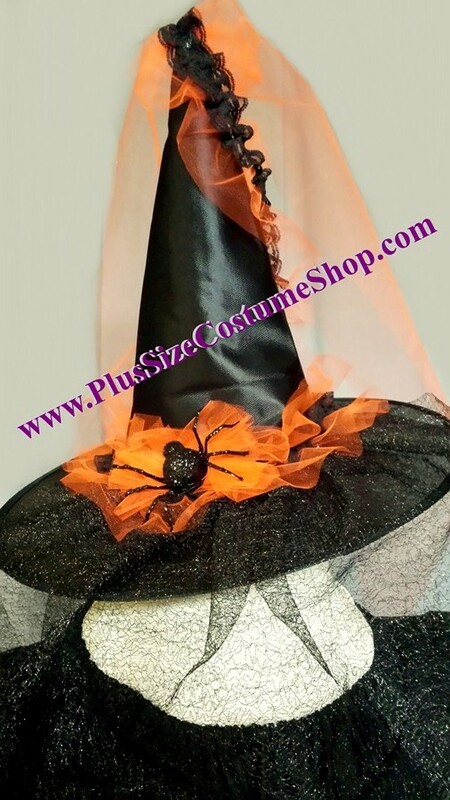 Also included is a black witch hat decorated with a black sparkle web tulle veil, orange tulle with black lace and a large black glitter spider.